Using patented, revolutionary antimicrobial Byotrol technology, Keratex Cleansing Hoof & Leg Scrub brings general horse maintenance into the 21st Century. It produces a cleansing foam when scrubbed or sponged onto hooves, frogs, soles, heels and pasterns, and can also be used on minor leg cuts, grazes and abrasions to remove dirt, cleanse and disinfect scabs and damaged skin. It is, therefore, perfect for use on mud fever, injuries or cracked heels. 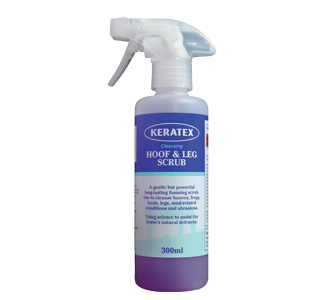 A top quality product that makes maintaining a bacteria-free atmosphere around the legs and hooves significantly easier. There are currently no questions for Keratex Cleansing Hoof & Leg Scrub for Horses - be the first to ask one!